Kay Pratt’s “HELP! 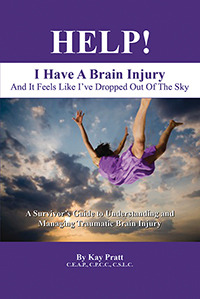 I Have A Brain Injury And It Feels Like I’ve Dropped Out of the Sky.” What do you know about Traumatic Brain Injury (TBI)? Will a survivor ever be the same again? TBI survivors share the answers to these questions and more through the voice of their experience. This book will provide answers to these questions and more. Beliefs about brain-injured individuals will be broadened and perspectives will be enlightened. Previous Previous post: How to Dazzle Your Readers With a Book Signing Event!